Denny Hamlin and the #11 FedEx Racing team posted an 11th-place finish at Phoenix International Raceway last weekend, leading twice for nine laps in the 312-mile event. The Toyota Camry was at its best early in the race, when Hamlin drove to the front at the drop of the green flag to take the lead from Kurt Busch on lap 32. Track position was vital and passing was at a premium, so a loose race car on restarts kept Hamlin from challenging for the lead in the second half of the race, spending the majority of the day in the back half of the top-10. The 11th-place result moved Hamlin up five spots in the Sprint Cup Series point standings, now 14th, 22 points behind leader — and Joe Gibbs Racing teammate — Kyle Busch, heading to Sunday’s race in Las Vegas. The Cup Series stays out west for a 267-lap event on the 1.5-mile Las Vegas Motor Speedway this weekend. Hamlin has three career top-10 results in five starts at Las Vegas, including a best finish of third in 2007. Hamlin endured a frustrating race at Lat Vegas in 2010, as an ill-handling race car prevented him from making a serious run at the race win before a 19th-place finish. The 2009 event was equally as frustrating, as a lap 3 incident caused front-end damage and later spin on lap 172 put the #11 Camry one lap down to the leaders. 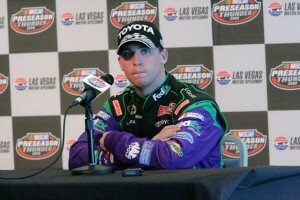 Hamlin finished 10th at Las Vegas as a rookie. The FedEx Ground Plains district (PLNS) will be on the b-post at Las Vegas Motor Speedway in recognition for their continued excellence in package care and quality. The Plains district encompasses all of Kansas and Missouri — including the Lenexa (Kan.) and Kansas City hubs — as well as satellite facilities in eastern Nebraska and much of Iowa. What do you enjoy about racing at Las Vegas? “It’s a good race and good race track. You see really close finishes at Vegas and that’s exciting for the fans and the drivers. It seems like we’ve never had a great car, or a great handling car, from the start at Vegas but we’ve been consistent enough to score some good finishes. That comes down to working all race long to make little improvements here and there, but also keeping in mind that the track will be different at the end. Having the car ready at the end is what wins you races. We have struggled the last couple years there, but I think we have a chance this year. We really improved our intermediate track program last year and won a few races at mile-and-a-halfs. I’m just looking to continue that into this season and get some good finishes in the upcoming weeks. How does Las Vegas Motor Speedway stack up against the rest of the 1.5-mile tracks?